Club Penguin Cheats by Mimo777 Club Penguin Cheats by Mimo777: Club Penguin Fire Dojo READY! Almost! WOW! Check out the Fire Dojo. Very sweet! It looks like to room is completely finished. So on November 24 we can start playing the new Card Jitsu FIRE game! YEAH! Of course this is a members only game. :-( More later... Thanks to the zillion of you who told me the new stuff was out! I just met Sensei at the Volcano, whoever, he's giving away the old wallpaper, so this isn't a good new. Plz post, this can be important for Sensei fans...see you around Mimo. You're welcome Mimo. Can you say that it was me? Please? Yay i cant wait! four more days over here!!! Can it just wait a little longer. I'm not a ninja yet and not even close. How do I become a ninja faster? so cool! mimo your asome! I wish I was a member for I want to become a fire ninja. ok this is crazy!!! guess wat im getting my membership back just for this!! Yep, Sensei is giving out his out background but the good thing is that hes changed his outfit! He wears the fire outfit. how do you get the pictures of your penguin on clubpenguin? Don't forget the new igloo stuff. I found sensei right now!!! hey Mimo I'm Cheda from webosaurs!We're quite good friends!I'm also Cheda1234 on CP! Well to become a Ninja faster, I don't really know how but my best advice is to keep trying! If it was you that gave him the cheat, then he would've given credit to you. He probably found this cheat before you. But if you find something extraordinarly awesomely oustoundingly cool (before Mimo)... he will mention you in his post. There is no specific cheat or glitch to become a ninja. But you can buy the power cards (I didn't becuz it seemed like a waste of money but that's just me). They are very special cards that help you win card jitsu games. They are availible at toys 'r us (and some targets) and maybe even walmart. But toys 'r us is probably the first place I would look. Good luck becoming a ninja! Find Print Screen on your key board, press that, open up your paint program and go to edit, press paste, TADA! i saw so penguins cheating. They copied exactly what i said instantly i reported them. Well, this is how I became a ninja faster (because I don't have enough patience to sit on the computer all day to become a ninja). If you have a friend or sibling who plays Club Penguin too, then you can just play with them... 1st game they let you win, 2nd game you let them win, etc... Hope this helps! Can't wait for the fire dojo to bre ready!! Well, you just have to keep on trying. That's all! Don't give up! I would suggest if you haven't yet, to compete when you click on Sensei insted of using the mats. And I'm sorry but no it can't wait just because of you, but it probably isn't going anywhere. mimo i just met sensie on sever squatch he just left and hes wearing his fire out fit so put up your tracker!! do rae mi fa so la ti doooo... ahem... WOOOOOOOOHOOOOOOOO!!! icantwaiticantwaiticantwait!! ohhhhhh boooooooy!!! see you then! tip- since the dojo, ninja hideout, and fire dojo will be PACKED, hit the = button on your computer to pixelize things. cp will run faster, making it easier for you to get in! Keep on Wadell-ing! To become a ninja faster let sensei choose your opponent and win alot. Good luck! you go ahead and do that man, but unless youve got $100 for me, im not gonna do it. i am NOT a morning person. i stay up late reading. i just fininished "Al Capone Does my Shirts" (i know youre supposed to underline book titles, not quote, but do you see an underline button? didnt think so)but i admire your "get up and go" attitude! Keep on Wadell-ing, early bird, err, penguin! It's pretty simple, actually, once you get the hang of it! First, you go to your Start button (this is to prepare yourself. You can do it after you get your screenshot, too!) and go to Programs. Go to Accessories, then Paint. It opens up a window with a bunch of stuff. You can draw in the white part. To get the actual screenshot, you press on your keyboard, Alt and Prt Scrn at the same time. Prt Scrn means Print Screen, but if you do Alt while you press it, it doesn't print the thingy. Then you go to the Paint window and go to Edit, then Paste, and your screenshot will be pasted onto your Paint image! Good luck getting some famous screenshots! Yeah, it really stinks doesn't it? Stupid members-only stuff! I'm not a member either. I can do with furniture and clothes for members, but this? This is just unacceptable! Well.... almost unacceptable.... i still play cp. How do we get into the Card Jistu Fire Room you were in?! PLEASE HELP!!!! Dont worry. This is just a minor glitch! Your buddies arnt deleted so dont panic. Anonymous said... How do you take pictures of your Penguin? Easy. Go on cp,open your player card and on your keyboard find the "Prt Sc Sys Rq" button...press it! Now open paint and hold down 'Ctrl and V'! Good luck! Anonymous said... How do you become a Ninja Faster? Well, talk to Sensei in the DoJo and click 'Earn Your belts' & verse other players. The more you do this the more chance you become a Ninja! If you become black belt, challenge sensei,beat him the you become Ninja! Mimo, can't mod till fridaY! Hope you understand! Awesome people! Sorry I can't comment and help people cause I have to go somewhere 3 hours away! So bye guys! I LOVE CP oh and btw, congrats all mega mimo mods especially Saavy. we used to be buddies! You forgot to say which server. I hope you enjoyed him though! Mimo, put on your sensei tracker again, because all around the web pplz are sayin they saw him. And I did too. So please, this would be good for fans. To goet in to the room you have to buy the amulet in the catalog, then click on the large stone with the fire sign on it in the Ninja hideout beside the river, then the door will open and you can enter! You have to really set your mind to it. If you click on Sensei, and battle against other people non stop, you will become one faster. If you do it non-stop, you can get it in two days, maybe even one! Mimo!! big news!!! the sensei was online on the server blizzard!!! omg!! he is dressed in the fire outfit to celebrate card jitsu fire!! I MET HIM i got a free autographed backround!!! It's pretty simple! First you find SysRq/Print Screen key on your keyboard! Second, you press that key when you want to take a picture of something. Third, open up your paint program, go to edit, then paste, Tada! You can go to Sensei and he'll talk to you. Then press earn belts then it'll select a penguin about the same skill level as you to battle you. Or you can go to the practice mats to practice! He is there right now! Get the sensei tracker out! I kjust saw sensei at town/Hideout/Volcano! Can it just wait a little longer.Im not a ninja yet and not even close.How do I become a ninja faster? 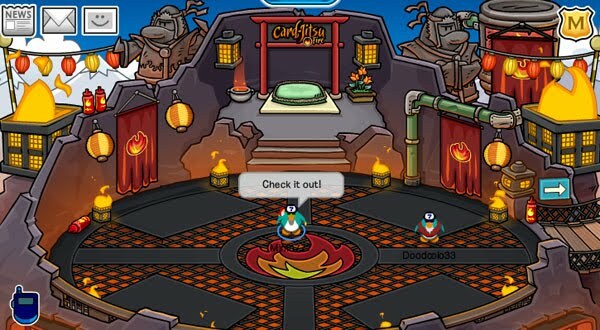 You can become a ninja faster by always playing Card-Jitsu whenever your on ClubPenguin and you will surely earn your belts faster.Also try getting the real Card-Jitsu set.I hope I helped! It might just be a glitch. Try to contact club penguin help and support. Or log off then onn and try different servers. Sorry, we already know and have seen comments that Sensei is appearing throughout cp. I met Sensei today! He was wearing 'FIERY' clothes! And he didnt go to the Fire Dojo, he only stayed at Hideout! 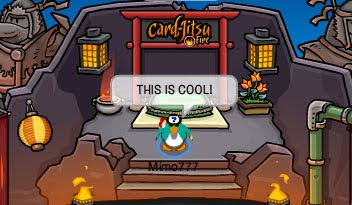 EVERYONE told MiMo, about new thing on CP, so he didnt post any names of us! I think MiMo will post a Sensei tracker really soon! Keep checking! You will find Sensei with other CPG fans' help! Mimo will probably make a Sensei Tracker later on since everybody's seeing him! Well everybody was telling Mimo about this so decided to give credit to everyone that told him about it which includes you! Me too! Whenever i get over 600 coins on puffle roundup it says i did something bad. I am going to email club penguin about this problem. You should too! Hey Mimo, when's the 3rd party clue coming? 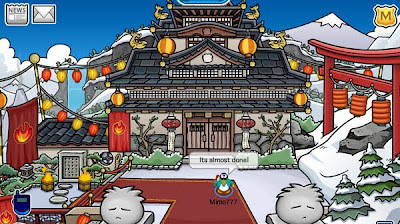 Mimo, Sensei is going around Club Penguin! He will only go on 4-5 star servers, he will be in the ninja hideout or fire dojo, and has on his fire robe! Hurry up and post this. He will only be on til the 24th. HURRY! hey mimo! just wondering if any CPG Mods will tell me how to comment on other peoples' comments?! i am trying to become a mod! Mimo! i have found a glitch at the snow forts You can't move click(as in Map,Penguin Account) and the Map goes flshing back to a different languege! That's easy, you just right click, copy, com up to the comment box, right click, paste, then answer their question! Also 4 more details look at the rules on top of the mod list where you see the link. Good luck! I would guess very soon because the second clue came a couple days ago. Sure!I had problems when I joined too.Drag your mouse over the comment you have selected,paste it into your chat bar,go a few lines down and enter you reply! Okay, just remember sometimes if penguins copy what you say it may just be because they want to spread the word, like if you started the commotion to tip the iceburg then everyone said that, they could've been helping you. Well a lot of times a lot of ppl give Mimo these "hints or cheats" but then he can't just give credit to one penguin. Sorry. It;s really awesome and i was the one of the first penguins to see it!I saw it before you posted it! "Can it just wait a little longer. I'm not a ninja yet and not even close. How do I become a ninja faster?" New Club Penguin series 5 toys are at my Toys R Us! They have a Cadence, Gary, a red hockey player, and a WHITE PUFFLE! Tell me if anyone else saw these series 5 toys! All you do is copy the comment and paste it in the comment box. Then create a line or anything else and just answer the question. Same with me. Just like J.P., I met Sensei on Snowfall in the volcano. This would be a fgood post for Sensei fans or people who haven't met him yet! im sorry but it cant wait and the only way to get to it faster is you have to buy cards cause they have a lot of abilitis or just win ten battles to get to the last belt. well im not a cpg mod but i can help you!all you have to do is copy there message and name and paste it on here.also beetween yours and there message just push the button with the line about 32 times.-zed199(cpg mod)hopes this helps! Mimo like J.P. said i saw sensei too and u can see him really in the fire uniform plz make a sensei comment finder for it for those who Won't get a chance in the next 3 days. I met Sensei. the wallpaper is the same.. XD. you don't have to post this cuz im gonna ask you a question. do you watch total drama action by any chance? is it possible to become a ninja without buying the cards? because i thought u had to defeat him to become a ninja and that it's almost impossible. If you go to the club penguin homepage, all the penguins are wearing ninja masks and belts. and you can also see the volcano in the background. cool huh? Step 1. Go to the comment you would like to answer. Anonymous u can become a ninja a faster way. First if u can afford it go to toys r us. Then purcuse the car jitsu pack. Dont get the card jitsu fire pack not able to lock code yet. Type in code then u level up a belt only if u have a gold card. I have one. I found sensei in frozen. seriously! i always wondered how you got into member places WITHOUT a membership... i always wanted to know. Have you noticed how the orange wig looks like puffle hair? Or how in the puffle party banner it has an orange letter? and I just got an e-mail from best friend who met sensei and he ask Sensei about the orange puffle and he said well you'll have to wait and see! Makes you wonder dosen't it? Wow how did you manage to get in their as a non member? It is possible to become a ninja without power cards! You just have think carefully and be confident! It's pretty simple! First you copy and paste that person's question, then paste it in the comment box, and then you answer it! Pretty simple eh?